This program was initiated in March 1962 by President John F. Kennedy and has been continued by all subsequent Presidents. Statutory authority for the program is Section 112, Title 38, of the United States Code. The Department of Veterans Affairs (VA) administers the PMC program by preparing the certificates which bear the current President’s signature expressing the country’s grateful recognition of the Veteran’s service in the United States Armed Forces. Eligible recipients, or someone acting on their behalf, may apply for a PMC in person at any VA regional office or by U.S. mail or toll-free fax. Requests cannot be sent via email. 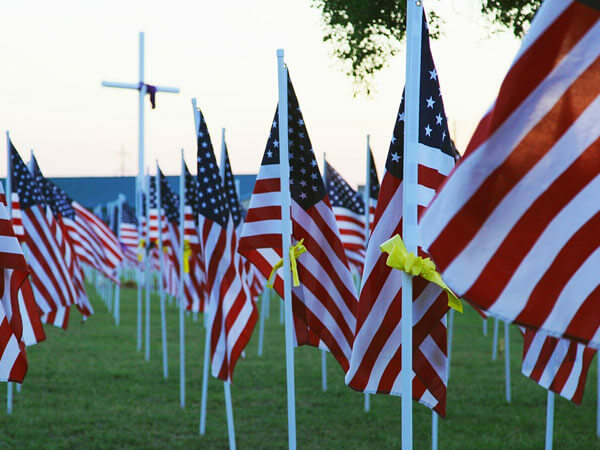 Please be sure to enclose a copy of the Veteran's discharge and death certificate to verify eligibility, as the VA cannot process any request without proof of honorable military service. Please submit copies only, as the VA will not return original documents. 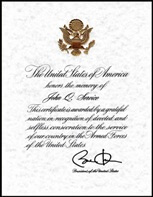 If you would like to apply for a Presidential Memorial Certificate, or if you have already requested one more than sixteen (16) weeks ago and have not received it yet, please call 1-202-565-4964 to find out the status of your request. Please do not send a second application unless requested to do so.